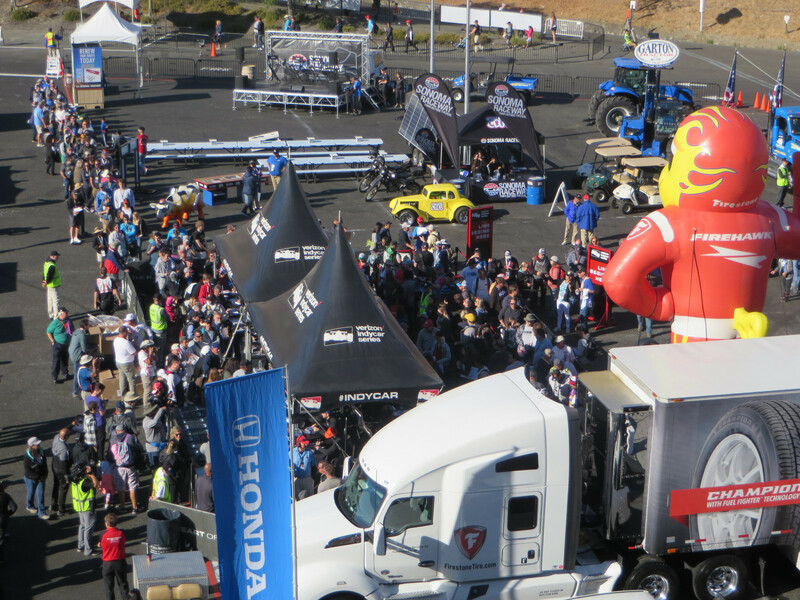 It’s another beautiful day for the IndyCar Grand Prix of Sonoma, the season finale for the Verizon IndyCar Series. 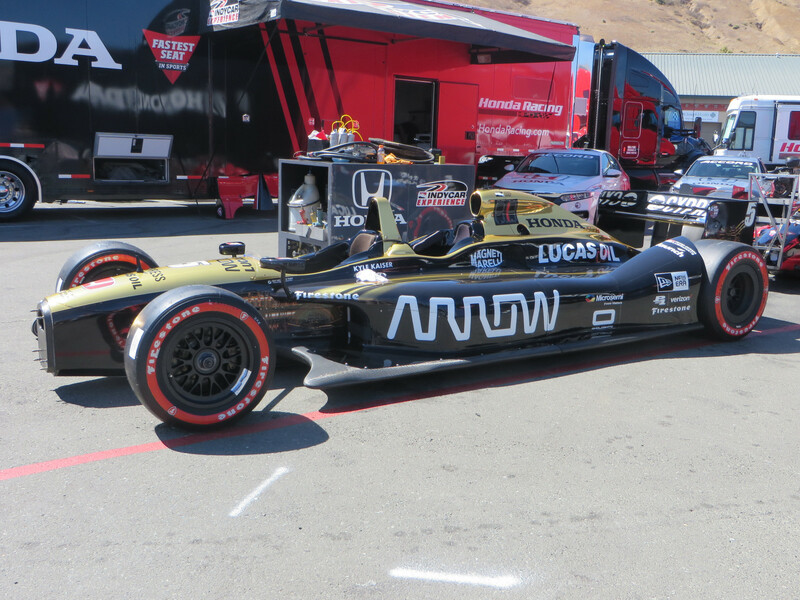 It’s a nostalgic day as it’s the last race of the 2018 season, the last race for Verizon as series title sponsor, and the last of 14 IndyCar races at Sonoma Raceway. 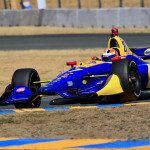 Next season IndyCar moves south in Northern California to Monterey and WeatherTech Raceway at Laguna Seca for the season finale. Sunday started out warmer than the previous two days, with temps in the mid to high 70’s degrees F, with but a gentle breeze. The day’s activities are ceremonial, warming and racing-related. 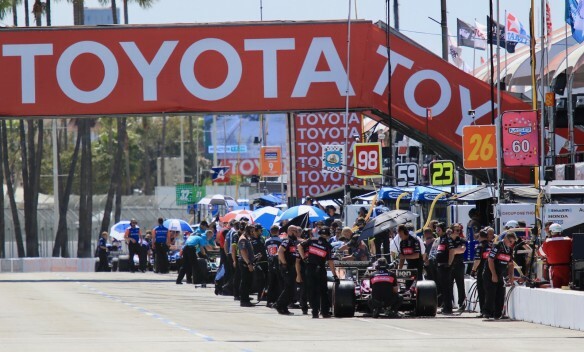 The Historic Trans-Am Series had a fifteen-minute warmup, and the three support series all had their second/final races of the weekend – Historic Trans-Am, IMSA Porsche GT3 Cup Challenge USA by Yokohama, and Formula Car Challenge. Something for everyone. 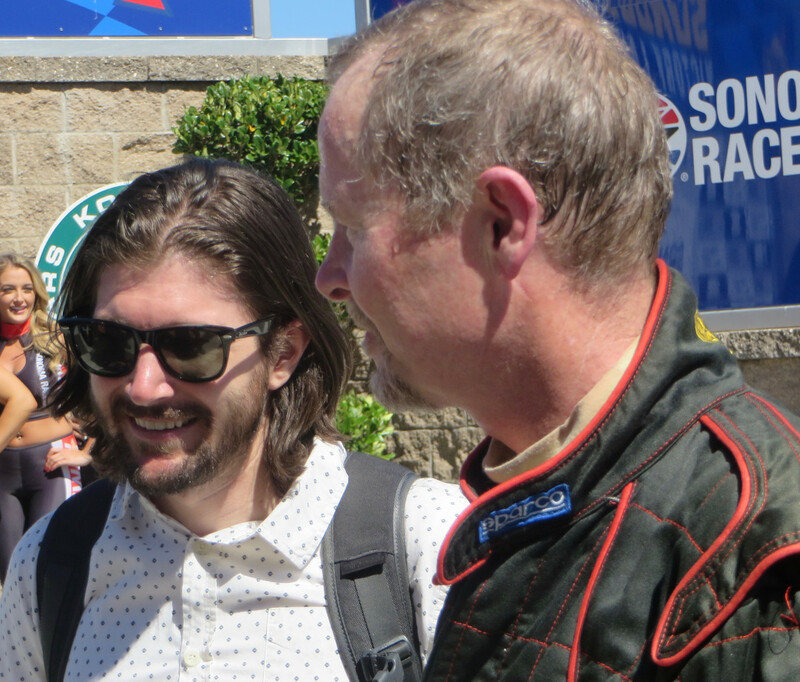 Left to Right: Sunday Trans Am winners, Ken Epsman, Brian Ferrin and John Hildebrand; The Gray Ghost; and Father and son, JR Hildebrand an John Hildebrand. Noted motorsports broadcaster, Mike Joy, was slated to drive the No.89 1966 Ford Mustang, but was instead back home trying to save his house from Hurricane Florence. Car owner Ken Epsman took his place for the warm-up. However, come race time, Kenny pulled one of his usual car swaps, and raced his No.2 1972 American Motors Javelin, and Richard Goldsmith drove the 1970 slime green 1970 Dodge Challenger that Epsman just sold him. 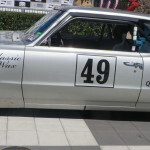 John Hildebrand, father of race car driver, JR Hildebrand, drove his own No.49 1964 Pontiac Tempest (Gray Ghost) to victory, after swapping the lead with several other drivers, so typical of this lively, frisky group. Second and third in the race were Brian Ferrin/No.45 1969 Ford Mustang Boss 302, and Ken Epsman/No.2 1972 American Motors Javelin. 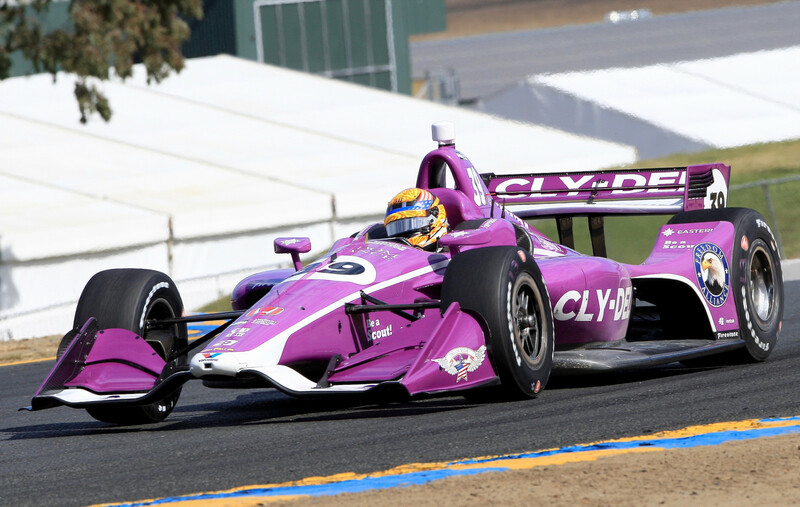 One sponsorship not going away is ABC Supply, for AJ Foyt Racing. 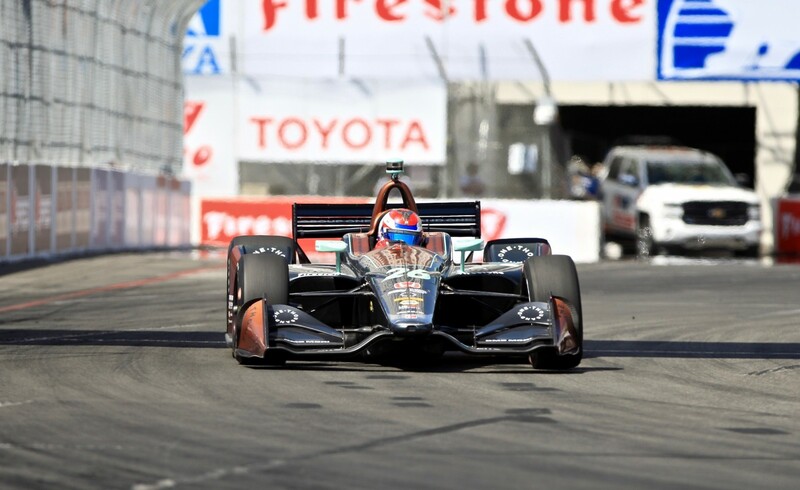 It is 14-years strong, the longest running team sponsor in Indycar. 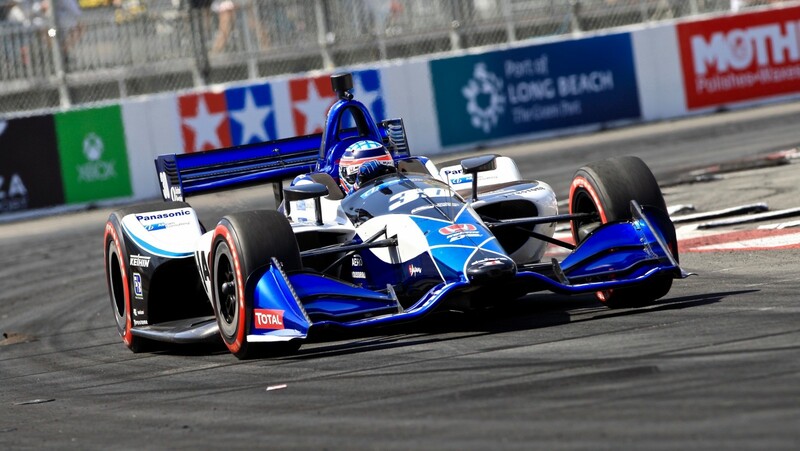 This weekend there will be 600 guests watching its driver, Tony Kanaan/No.14 Chevrolet start his 300th consecutive indycar race. He’s actually run 360 such races. He won the first IndyCar race at Sonoma in 2005. Within the Formula Car Challenge 28-car field, there are four separate classes: F4, FM, FS, and PFM (Pro FM), all competing for their own separate championships. 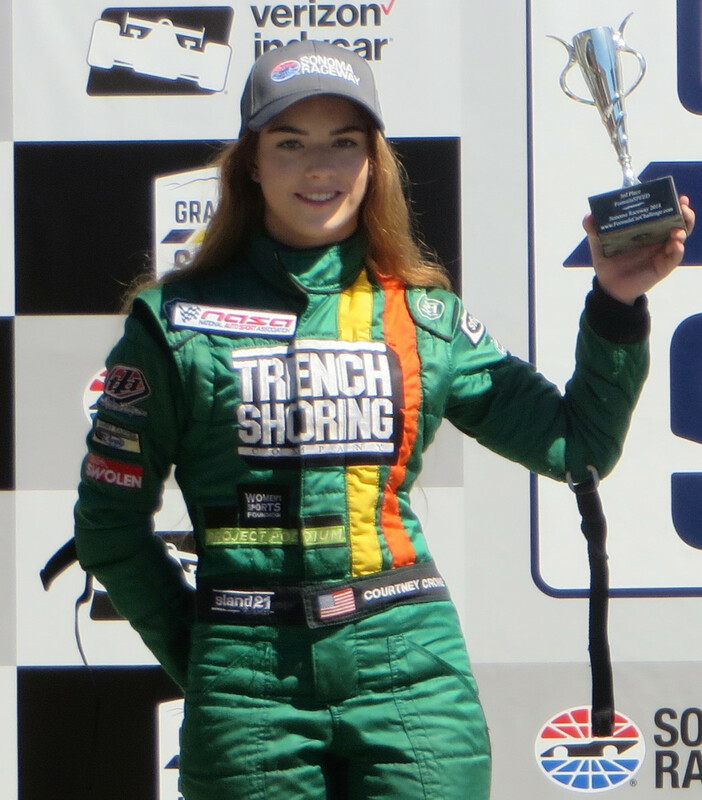 On the podium, there were distinct age groups, with the PFM group having the most veteran racers, F4 which is a FIA class and the none of the drivers are old enough to drink champagne, FM and FS – other classes with mostly teenagers. Left to Right: PFM and Overall Winner Saturday and Sunday, Patrick O’Neill; Saturday FS Winner, Courtney Crone; Sunday FS Winner, Rayce Dykstra. 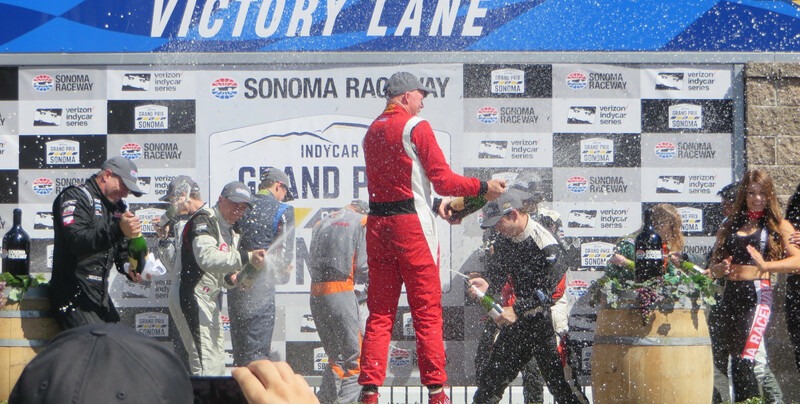 Local driver, Patrick O’Neill/No.64 PFM again won overall and PFM, as he did yesterday. Quite handily yesterday, closer today. He turned the fastest race lap both days. 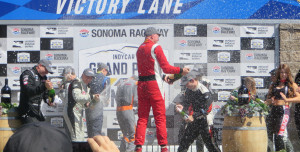 Seventeen-year old Scott Huffaker/No.09 F4 won the F4 Class both days, and sprayed Cider. 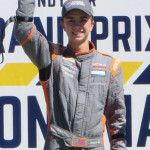 Bryce Cornet/No.1 FM won his class both days. 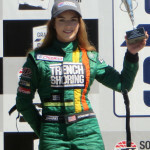 Fifteen-year old Rayce Dykstra won the FS Class Sunday, and seventeen-year old Courtney Crone won it Saturday. 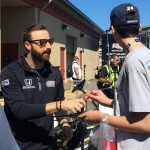 Left to Right: James Hinchcliffe, Graham Rahal, Simon Pagenaud, Takuma Sato, Scott Dixon, and Alexander Rossi. Photos by Pablo Matamoros. 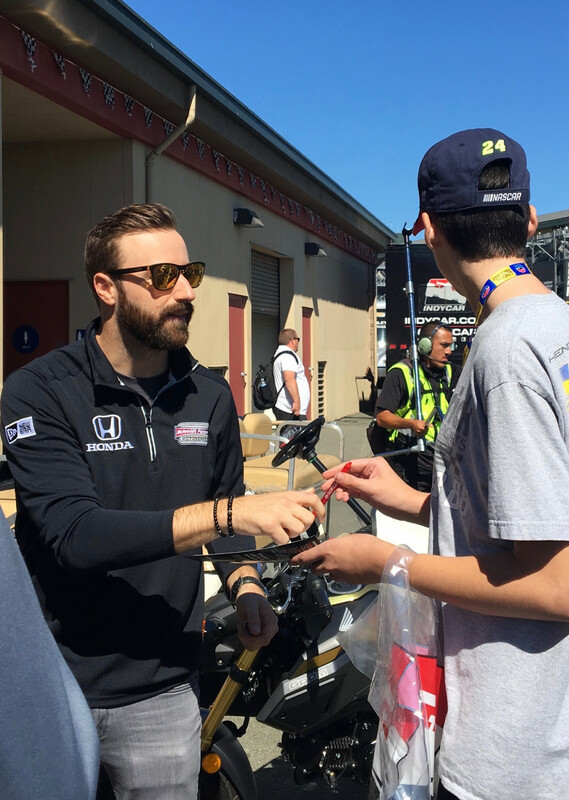 In the paddock, knowing fans congregated outside the IndyCar Drivers’ Meeting, seeking autographs or a chat. The drivers were most obliging. 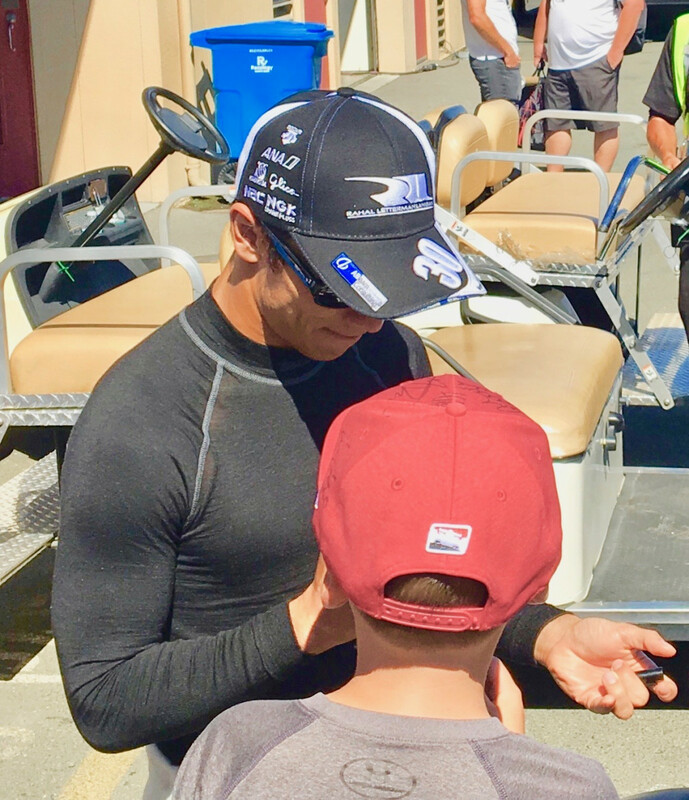 It was nice to see so many young fans seeking and being granted their requests. 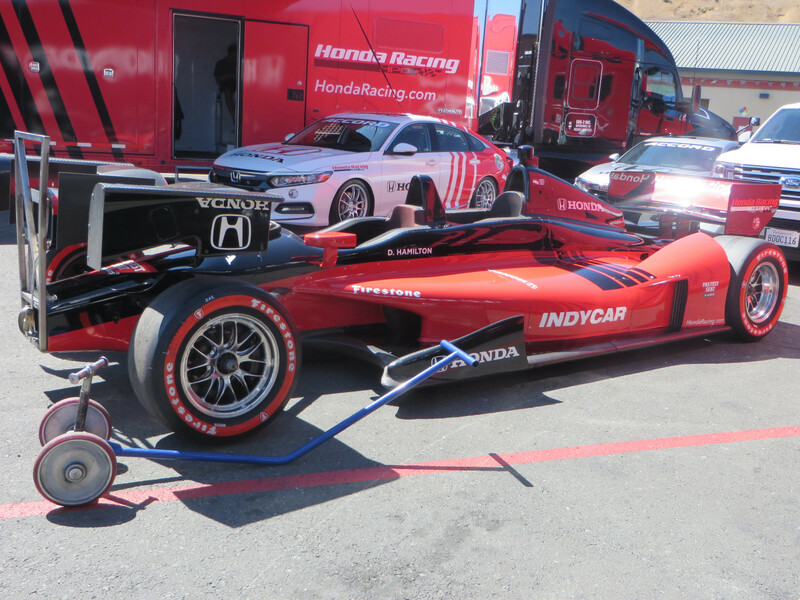 Left to Right: Juan Piedrahita’s Honda; Kyle Kaiser’s Honda; and Davey Hamilton’s Honda. The IndyCar Experience two-seater cars this weekend had five drivers. Mario Andretti, Davey Hamilton, Juan Piedrahita, Kyle Kaiser, and Matt Brabham. The first three handled the duties for VIP rides on Thursday and Friday. Saturday Kaiser joined them, and Sunday there were five cars with Brabham. 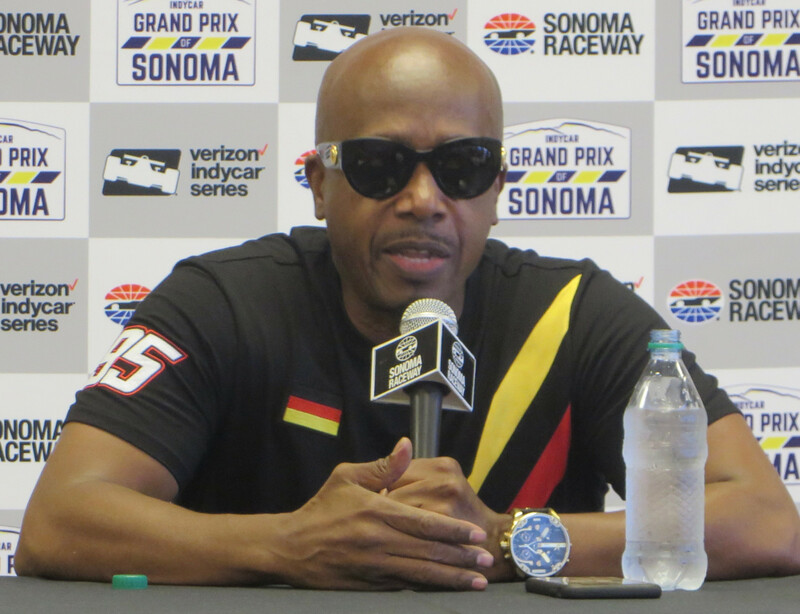 MC Hammer is the Grand Marshal for Sunday’s IndyCar race. As such, he will give the “Drivers Start Your Engine” Command. 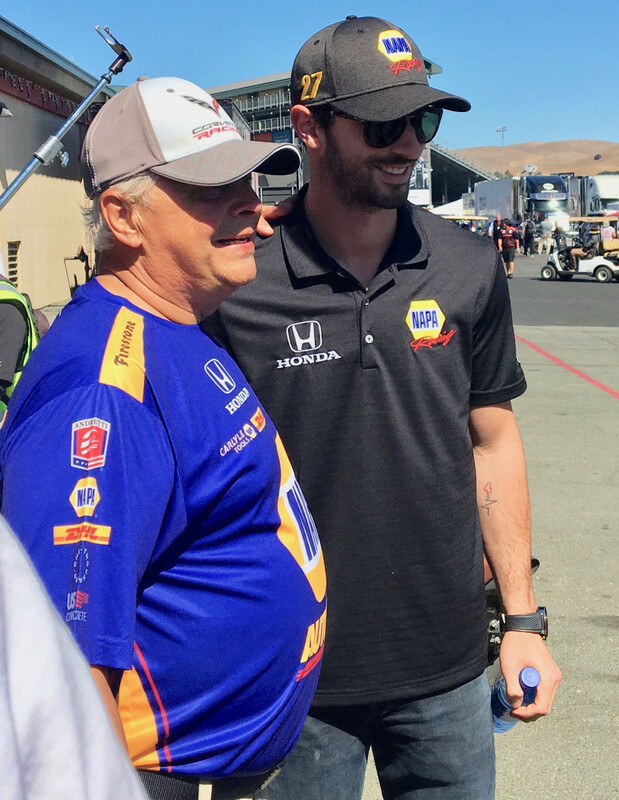 He will also ride with Mario Andretti in the IndyCar two-seater and lead the field to the Green Flag. Hammer met with the media and regaled them with humorous anecdotes and opinions on a variety of subjects. 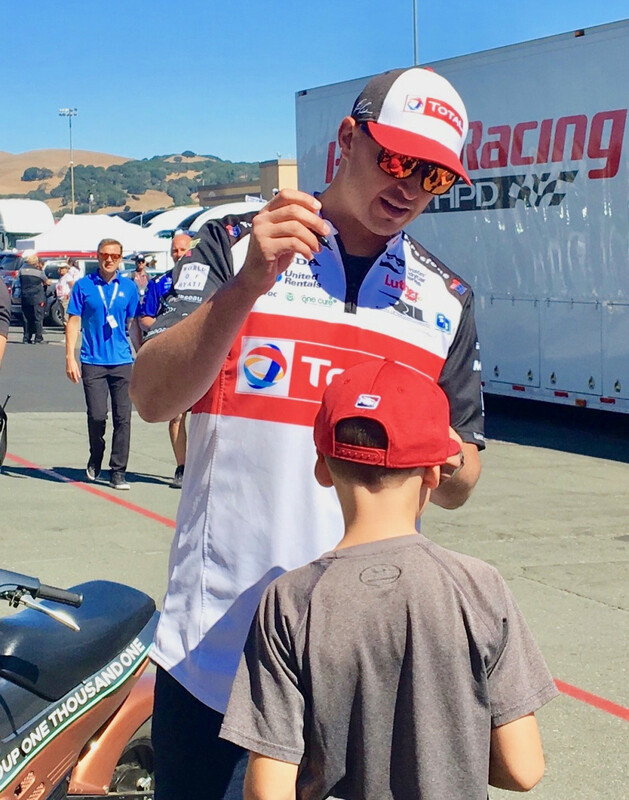 He’s a local lad, growing up in Oakland, and loves motorsports and local sports. In the IMSA Porsche Race, Pole sitter Zacharie Robichon/No.19 Porsche 991/2017 won overall and the GT3P class, and turned the fastest lap of 1:37.827/87.766 mph. 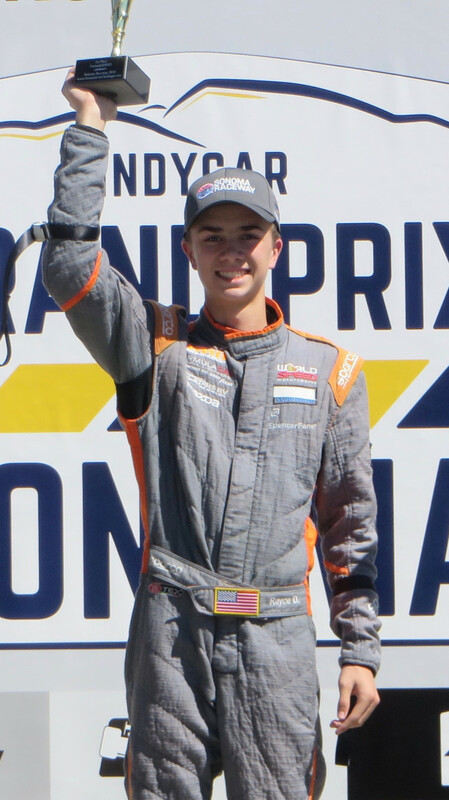 Second and third were Trenton Estep/No.3 Porsche 991/2018 and Roman De Angelis/No.1 Porsche 991/2018. Victor Gomez/No.25 991/2016 won the GT3G class, and turn the fastest class lap of 1:40.318/85.587 mph. Second and third were Mark Kvamme/No.43 Porsche 991/2017 and Kurt Fazekas/No.52 Porsche 991/2016. There were 18 starters, and sixteen finishers, with 14 of them on the lead lap. Sunday IndyCar Rookie of the Year, Robert Wickens tweeted from his Rehab Facility bed to wish everyone good luck and promise that he was going to rehab as fast and as hard as he could. Better! Stronger! Faster! That’s the mantra in the IndyCar paddock, and on the stickers seen everywhere and on race cars. Scott Dixon No.9 Honda. Photo by Pablo Matamoros. 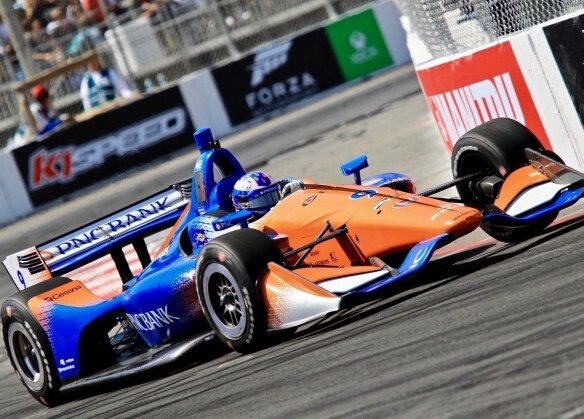 The weather warmed up nicely Friday afternoon, to nearly 80 F for the afternoon practice for the Verizon IndyCar Series, with wind ramping up to 6mph. Nothing like the gales and gusts experienced yesterday. Second through fifth were Ryan Hunter-Reay/No.28 DHL Andretti Autosport Honda, Joseph Newgarde/No.1 Verizon Team Penske Chevrolet, Takuma Sato/No.30 Mi-Jack/Panasonic Rahal Letterman Lanigan Racing Honda and Scott Dixon/No.9 PNC Bank Chip Ganassi Racing Honda. 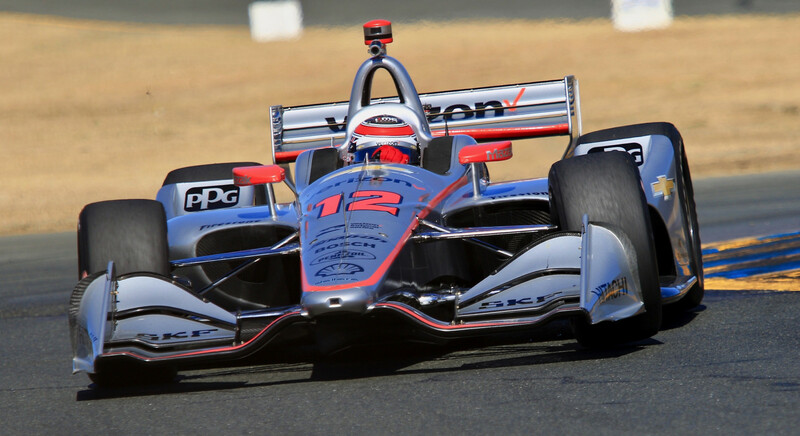 Other leaders in the afternoon session were Will Power/No.12 Verizon Team Penske Chevrolet-twice, Kyle Kaiser/No.32 Juncos Racing Chevrolet, Gaby Chaves/No.88 Harding Group Chevrolet, Simon Pagenaud/No.22 DXC Technology Team Penske Chevrolet, James Hinchcliffe/No.4 Arrow Electronics SPM Honda, Power, Newgarden, and Graham Rahal/No.15 Total Rahal Letterman Lanigan Racing Honda. 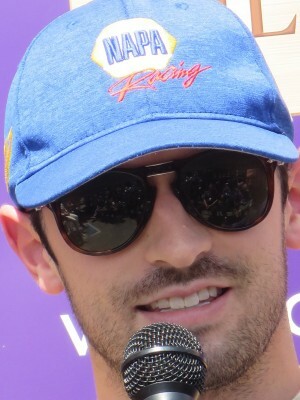 RHR held the time much of the session, before Rossi topped him. 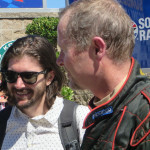 Dixon and RHR were the fastest two drivers for the day. 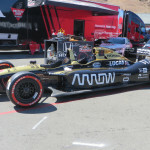 Overall, the top five were Dixon, RHR, Rossi, Pagenaud and Hinchcliffe. 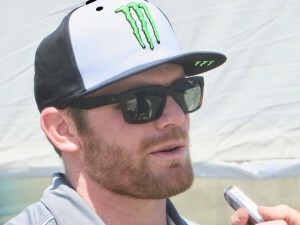 Declining to give away his tire strategy going forward, Dixon said his Preferred Tires were all blacks.” RHR agreed. 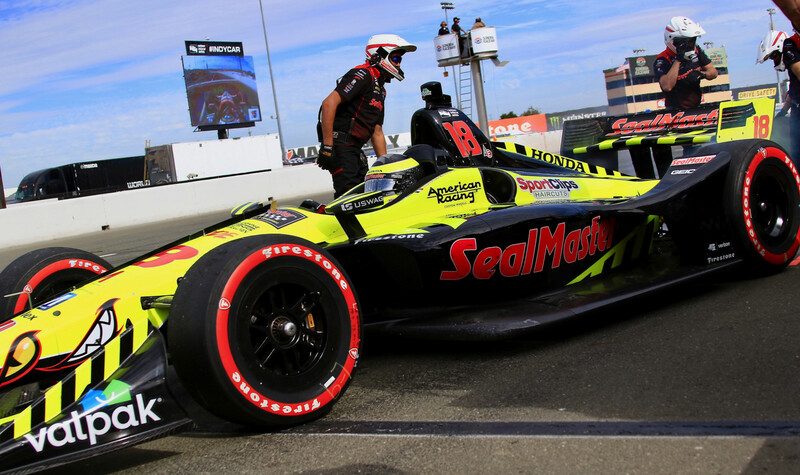 Watching the on-board video from Sebastien Bourdais/No.18 Team SealMaster Dale Coyne Racing Honda, one gains a whole new appreciation for how bumpy is the ride. 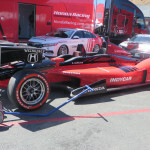 There were several stalls and stumble, for the most part no harm-no foul, including but not limited to: Pagenaud, Dixon, Rookie Zachery Clamon de Melo/No.19 The Paysafe Car Dale Coyne Racing Honda, Kaiser, and a couple of cars so fast to recover they weren’t identified. Someone in a blue car grazed the concrete wall but kept on going. Charlie Kimble/No.23 Tresibe Carlin Chevrolet kissed the front straight concrete wall and continued. It was more like a hen peck. Newgarden was eating lunch and was late to the mandatory weigh-in after the first IndyCar practice. 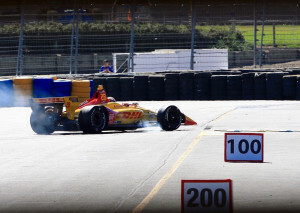 His punishment was to be parked for the last ten minutes of the second practice. 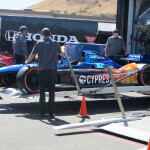 All 24 drivers were weighed after the first practice session – that session chosen as it’s the least busy for the IndyCar tech team. 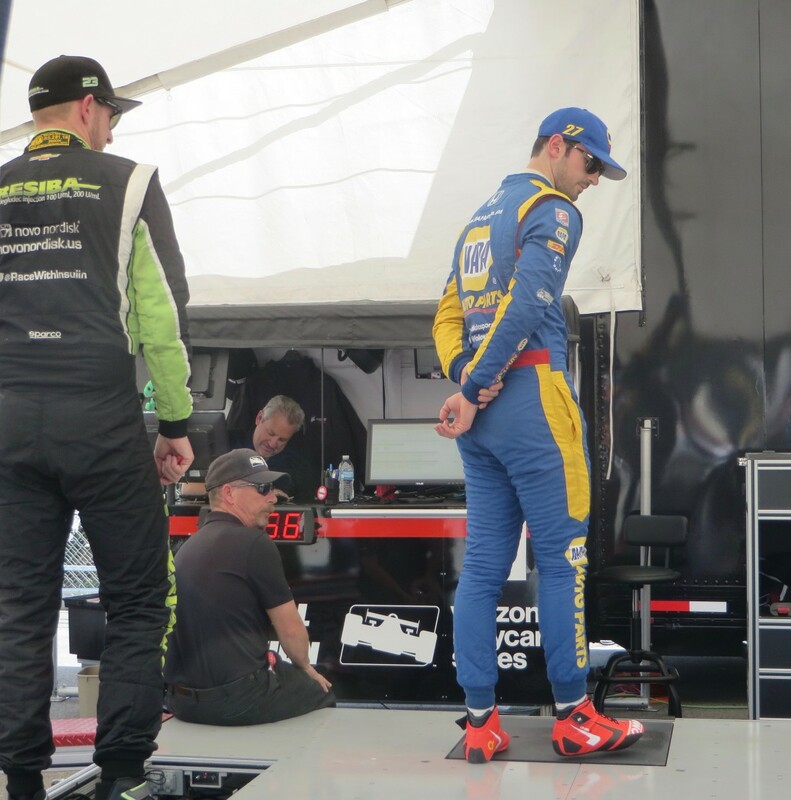 The weights are averaged, and when the average weight is determined, each driver either is allowed to find ways to delete weight from the car to compensate, or add weight to the car to compensate up to the average weight. 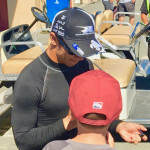 Last year Graham Rahal was the ‘heaviest’ of the full-time drivers. This year at this weekend, the specific details are not yet known. 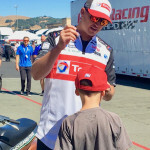 But, no matter what is the magic number, Rookie Zach Veach will have to add weight to his car. 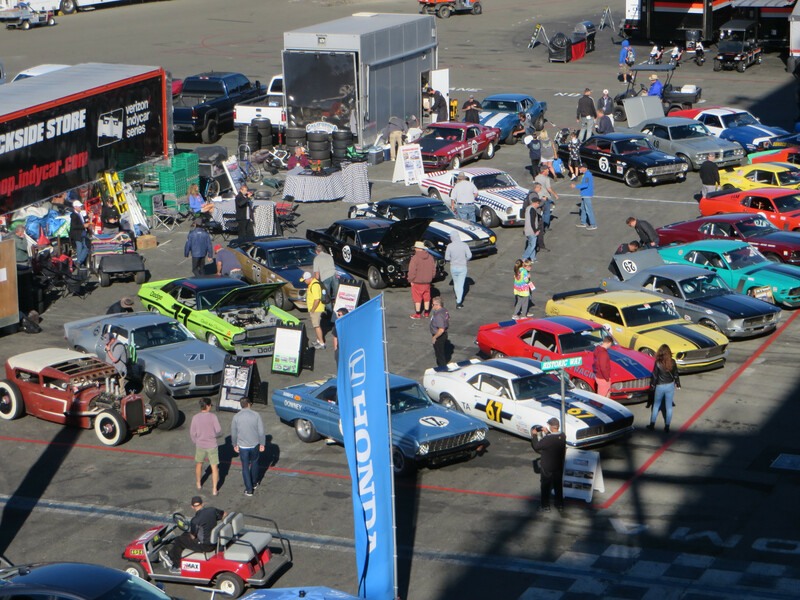 Thirty-two HMSA Historic Trans-Am cars are entered for their Challenge race. 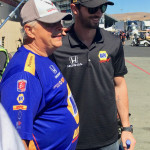 One of the drivers is John Hildebrand, father of IndyCar driver, JR Hildebrand, and JR is here crewing for his Dad. The Hildebrand 1964 Pontiac GTO is Number 66 – same as JR’s 2018 Indy 500 car. Historic Trans Am cars are required to have a documented history, be prepared to the period specifications, liveried in the manner they raced, and have actually raced in the Trans-Am Series 1966-1972. That is the cutoff date, according to Series Director, Chris van de Griff, as SCCA changed the rules after that and the current Trans Am Series is nothing like the original. In the Friday afternoon Trans Am session, Chad Raynal/No.64 1969 Chevrolet Camaro was fastest. Second fastest was Karman Cusak/No.22 1968 Ford Mustang. Jimmy Hague/No.16 1970 Ford Boss 302 Mustang was third fastest. 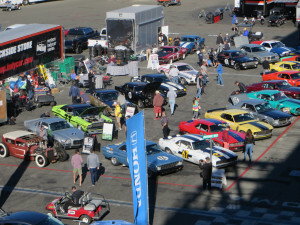 Twenty-seven cars were on course. Robbie Gordon/No.7 was fastest in the midday practice session for his Super Stadium Truck Series. His fastest time was 1:45.6727 including the ramps and jumps. 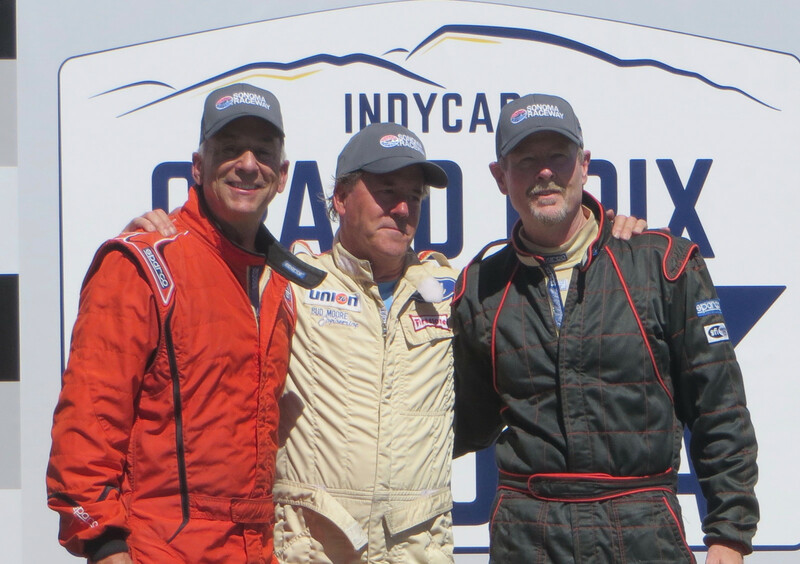 He was followed by Series points leader, Matthew Brabham/No.83, Jeff Hoffman/No.47, Gavin Harlien/No.55 and Blade Hildebrand/No.68. There are 14 Trucks in all. Another IndyCar driver was announced Friday for this year’s Indianapolis 500 race – James Davison of Australia. 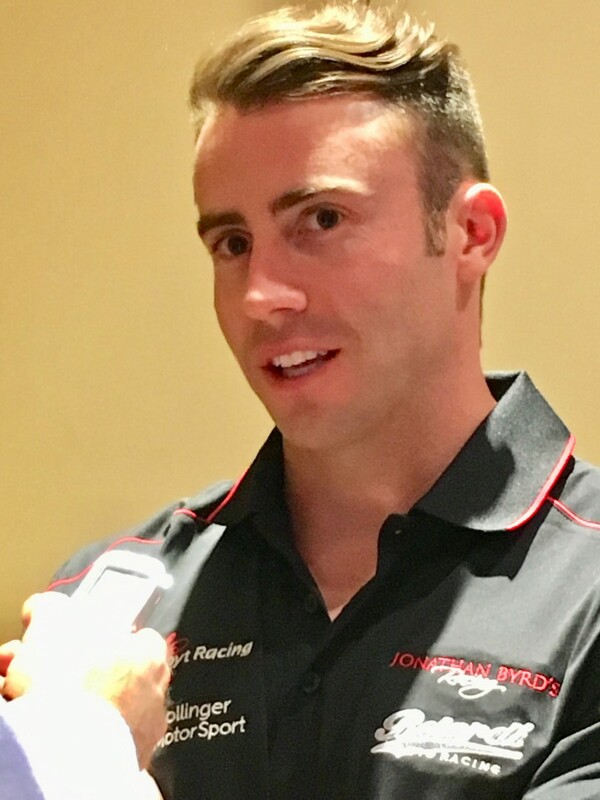 He will drive No.33 Chevrolet for Foyt Racing-Byrd’s Racing, Hollinger Motorsport and Belardi Auto Racing. Try saying that fast, even once. Last year Davison filled in for the injured Sebastien Bourdais – on short notice. 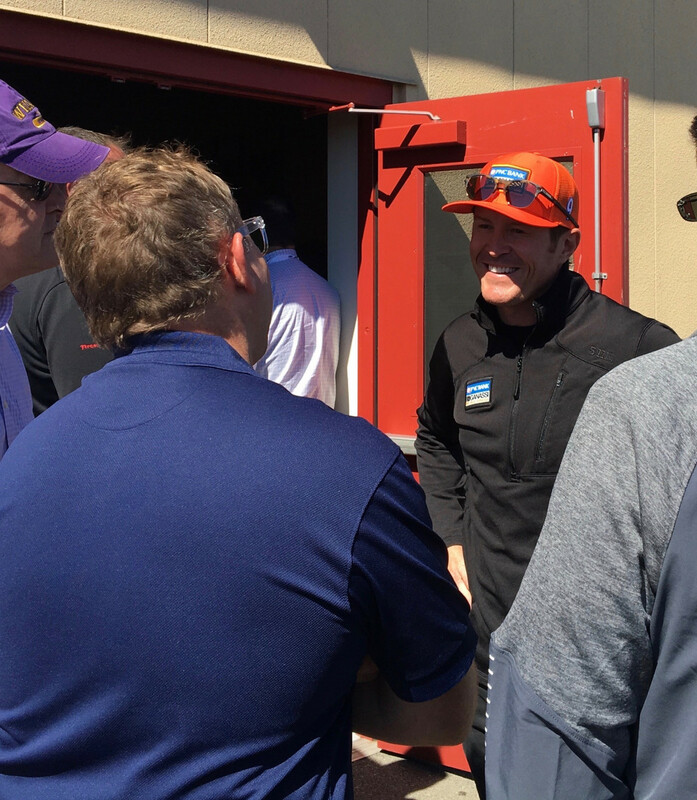 This year Davison is tickled that he will be having his first full two-week program. 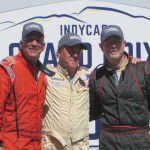 It was seeing Davison fill in for Bourdais that first brought Davison to the attention of the Byrd Brothers. Hollinger Motorsport supported Davison in last year’s Indy 500. 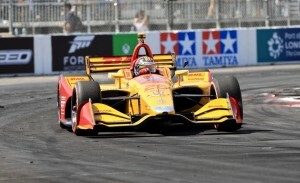 Davison was running fifth when involved in a multi-car pileup. 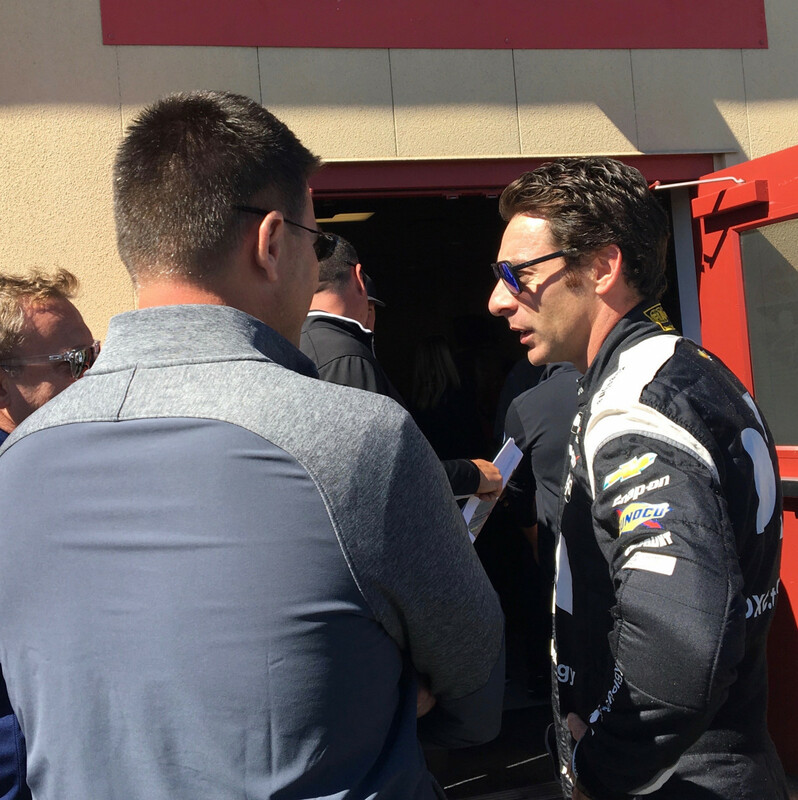 For the first time in awhile, there will be more than 33 entries for the 2018 Indy 500. 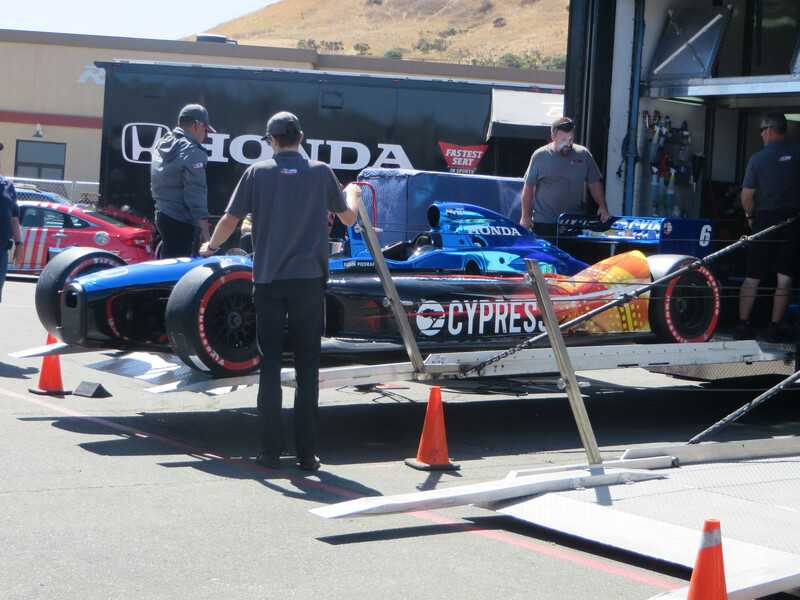 Also running the race is Conor Daly, who will run the No.17 Air Force Honda for Dale Coyne Racing and Thom Burns, who partnered with Buddy Lazier last year. Daly acknowledged that it is a low-budget program so there will be no SIM testing. 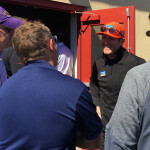 He is re-viewing his previous race videos and has kept up with his race workout training. 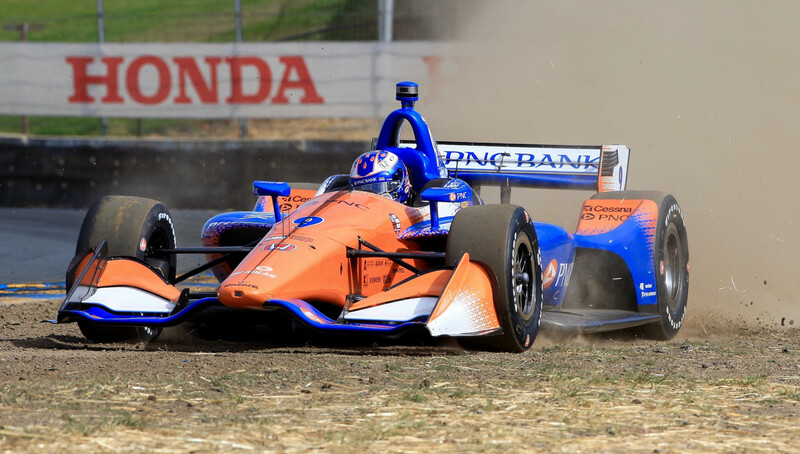 A refresher Indy 500 session will be held on 30 April 2018 at the Brickyard. Saturday’s IndyCar schedule calls for a morning practice and mid-afternoon qualifying.